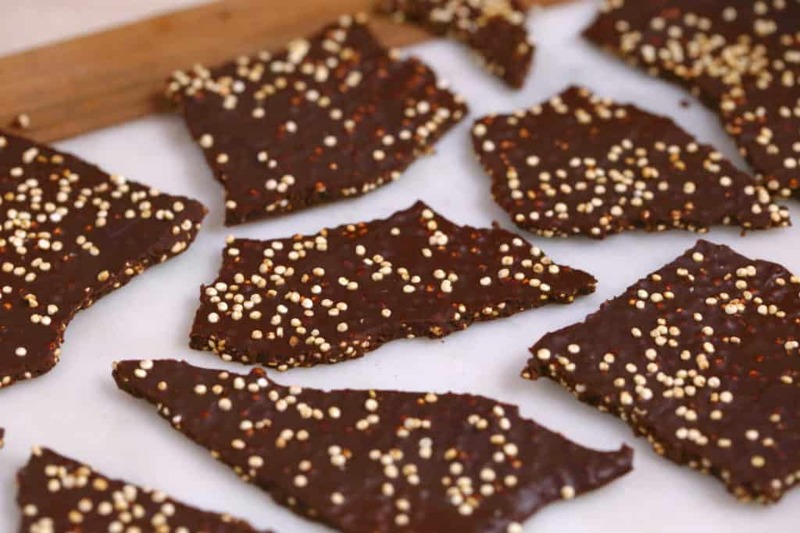 With just 2 ingredients and minimal prep, you can make this sweet-and-crispy dark chocolate quinoa bark, featuring puffed quinoa instead of puffed rice! 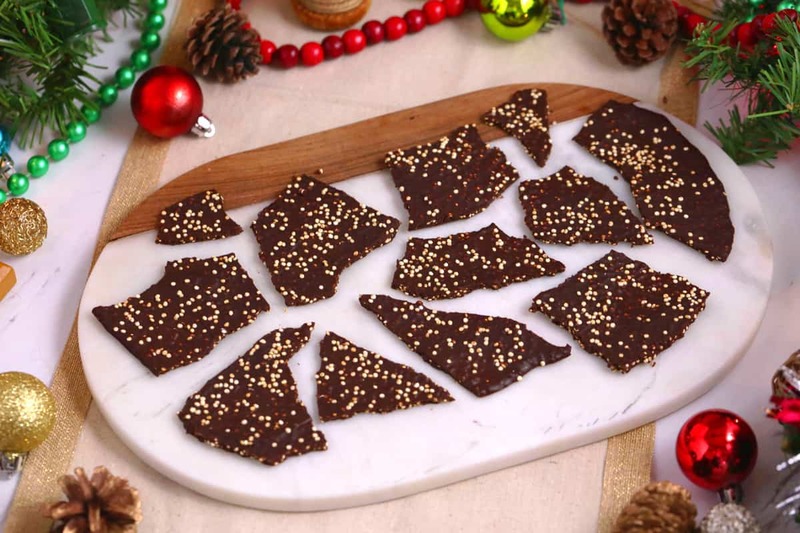 A deliciously simple and more fuel-filled Christmas chocolate bark option. Or, a tasty homemade Christmas gift that’s sure to please! Simply heat uncooked quinoa in a skillet and watch it pop and puff up like magic. Mix it into the chocolate base, and you’ve got a superfood version of a Crunch candy bar! But, instead of puffed rice, the puffed quinoa packs plant-based protein, fiber, vitamins, and minerals into this holiday treat. And, YOU get to choose the chocolate! 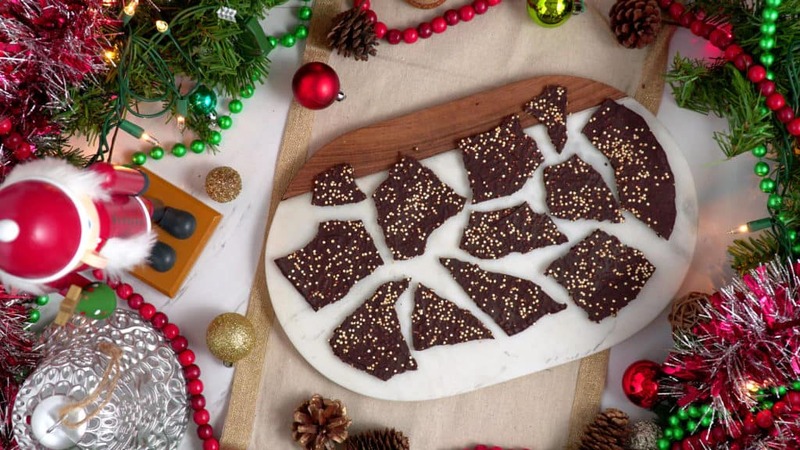 You can stick with classic milk chocolate, dairy-free for a vegan holiday bark, or even make a white chocolate quinoa bark. Personally, I like to use a 60% cacao or darker chocolate for minimal added sugars and maximum antioxidant benefits! I’ve gotta say, I was surprised by how easy it is to make puffed quinoa! To start, you’ll just need a wide nonstick skillet on the stovetop over medium-high heat. No need to add oil or cooking spray—the key here is to get your pan at the right temperature. First, test just a pinch of quinoa on your heated skillet. If the kernels of quinoa pop within a few seconds, your skillet is ready! If not, toss out the test quinoa and let it heat up a bit more. Once heated, sprinkle fresh quinoa to cover your skillet in a single layer. (But, not too much—you want a bit of room still on the pan.) Then, once your quinoa gets to popping, set aside your puffed quinoa and repeat the process until you have enough for the recipe. That puffed quinoa is SO satisfyingly crispy, and the toasting also helps remove the bitter notes it inherently carries. 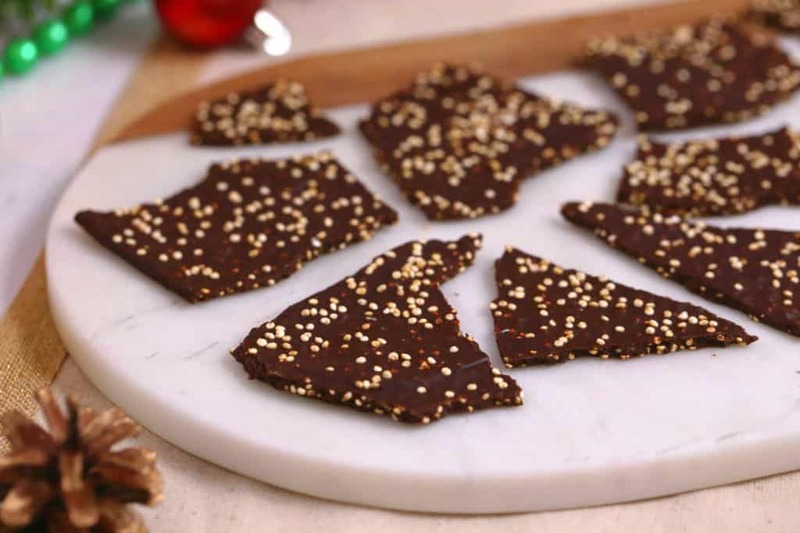 So, I recommend puffing up a bit extra to sprinkle on top of your dark chocolate quinoa bark, so you can enjoy twice as much crave-able crunch! Hungry for more healthy holiday goodies? 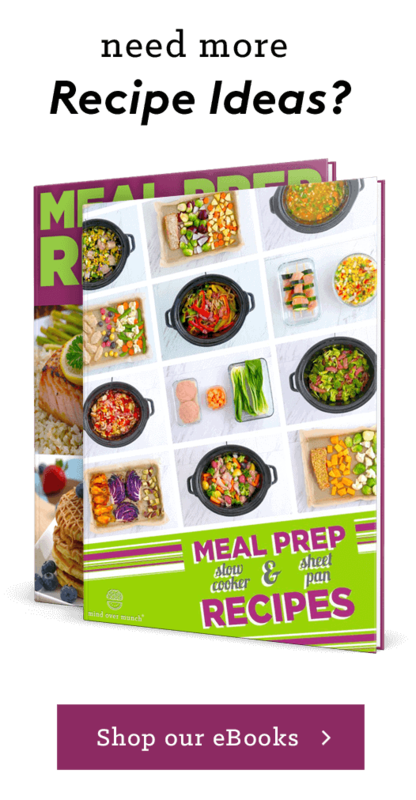 My 150+ Healthy Holiday Recipes eBook is chock-full of ‘em! Heat a wide nonstick skillet over medium-high heat. Test a pinch of quinoa—if it pops within a few seconds, the skillet is ready! If not, let it heat up a bit more. Once skillet is hot enough, toss out any test quinoa. Sprinkle fresh quinoa onto skillet—just enough to cover the skillet in a single layer, but not too crowded. When quinoa begins to pop, lift and shake the skillet off the heat, and pour into a bowl. Repeat until you have ⅓ cup puffed quinoa or more, if desired. I like to puff a bit of extra quinoa to sprinkle on top! Melt chocolate in a bowl over a double boiler or in the microwave. Fold in puffed quinoa and spread over a sheet of parchment paper on a baking sheet until you have a layer about ¼-⅛ inch thick. Allow to firm up in the fridge, about 2-4 hours. Once set, break chocolate sheet into pieces with your hands! *Use dairy-free chocolate for vegan chocolate bark. **Nutrition provided for dark chocolate quinoa bark made with 60% dark chocolate, divided into 16 pieces. Exact values will vary slightly, depending on size of bark pieces. Is Dark Chocolate Healthy? 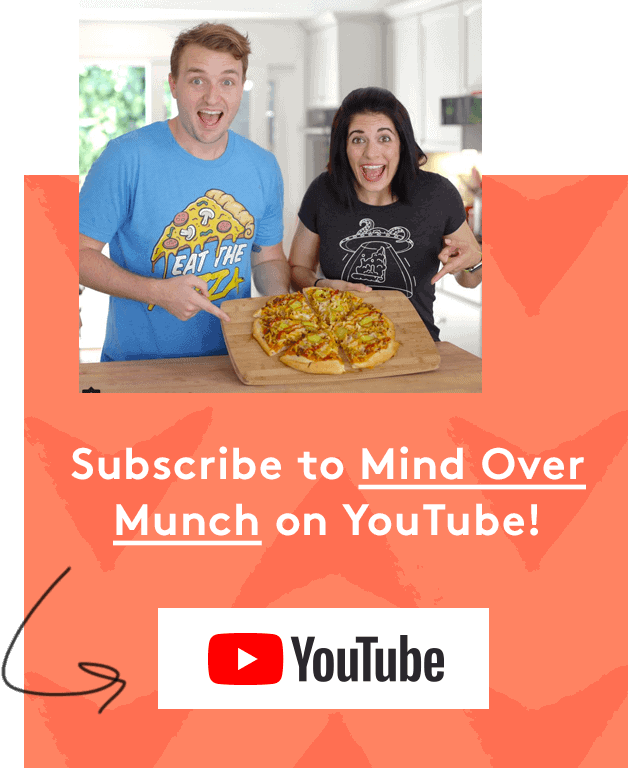 Misconceptions, benefits & more! FAN REQUESTED! 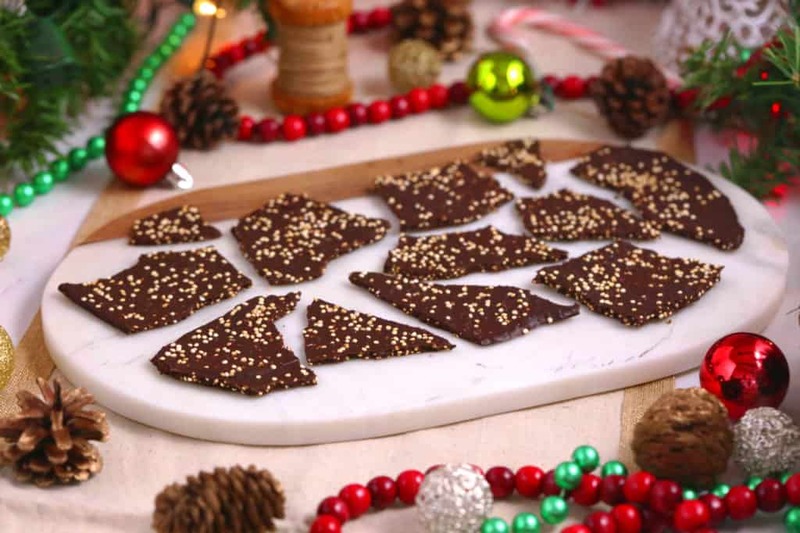 Healthier Holiday Bark – 3 Ways!